The FLAK is done!!! I've not had a sweater fit me so well before and it isn't even blocked yet! The photo makes it look a bit out of square but it isn't really. 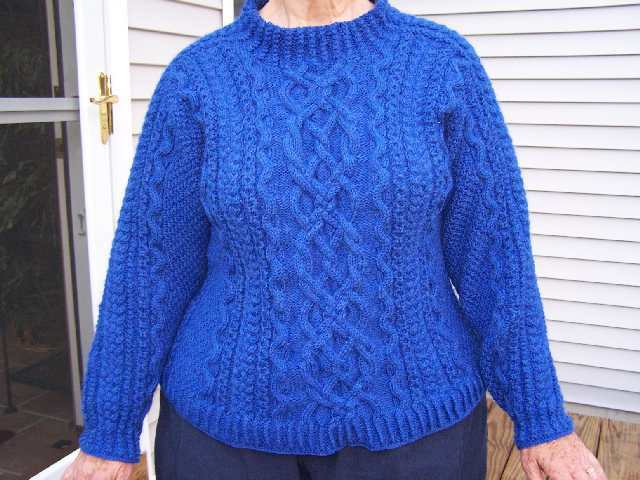 I learned a lot making this sweater and look forward to making another one with different cables. 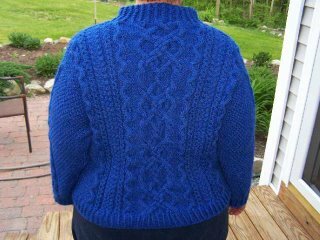 I added cables down the side where a seam would have been under the arms if this hadn't been knitted in the round. I've been skimming Janet's new Aran design book and an anxious to start a new Aran. However I WILL wait until I have finished the SFC Fair Isle. 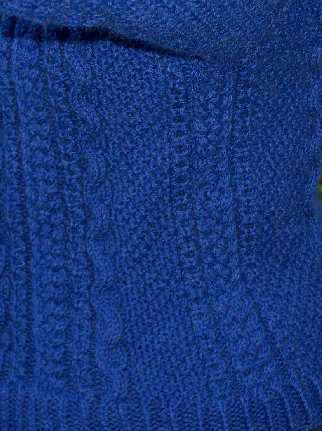 This FLAK took 8 skeins of 220 yard skeins of Cascade 220 in a royal blue type color. I would use this yarn again for an Aran as it does show the cables well. 80 degrees today in Maine so won't be using this sweater for awhile. Will get it blocked and ready for fall. Thanks for all the encouragement and participation from the FLAK group. Anne, Congratulations! She's a real beauty. Love the color. It's gorgeous! I love your center cables, mine is awaiting the buttonband directions. Wish now I had gone with a pullover it would have been long done! Hey.... what a beautiful job you did! And the great thing is, there is not another one like it. Very very nice! 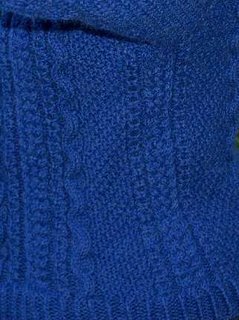 Looks great on you, beaufiful sweater! Wow!! That is gorgeous! The cable work is so beautiful. How I wish I could wear cable sweaters. That is one gorgeous sweater! Great job. The fit looks perfect and the cabling is awesome. Love that cable under the arm. I'll be keeping that in mind for future projects. You did such a great job; it looks fantastic! I love the colour. I haven't even moved beyond the swatch yet - my bad. The fit is perfect. Congratulations! Anne that sweater is beautiful! It looks molded to you perfectly, very nice job!